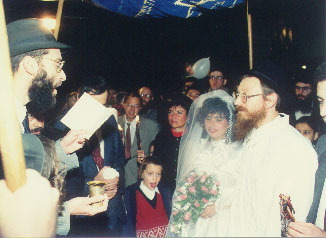 We were married in the Holy City of Tzfat, Israel, at Beit Chabad in the Old City, on Rosh Chodesh Shvat, 5754, January 13, 1994. Chayim agrees to the obligations of the Ketubah. 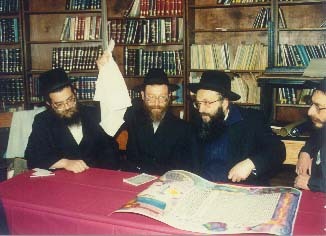 Rav Yisroel Rottenberg (left), Rav Refael Weingot, of Yeshiva Shalom Rav, and Rav Gavriel Marzel, of Beit Chabad. Click to see the Ketubah. Or, go to What's New in order to obtain a readable black and white version. Simcha Layah, the queen Kallah on her "throne", and Chayim and seeing each other for the first time in a week. 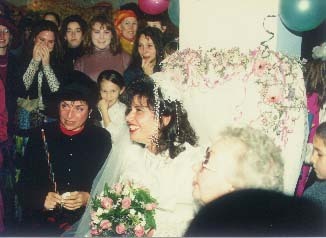 Simcha Layah's mother is on her right, and Chayim's mother is on her left. 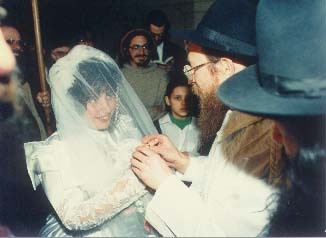 Chayim's sister Debra is just above Simcha Layah's head, with the fingers on her chin. Chayim is authorized to touch Simcha Layah for the first time in their lives, as he places the ring on her finger and recites the formula, "Harei, At M'kudeshet Li..." (Behold, you are consecrated unto me...) Click on the picture to see video of it (449 KB--Under 2 minutes' download with 56K bps modem). Rav Chanina Brinn recites the 7th Brachah, in which all join in places. You can see the blue Chupah above their heads, outside, under the stars in the Holy City of Tzfat. Click on the picture to hear a sound clip of it (231 KB). 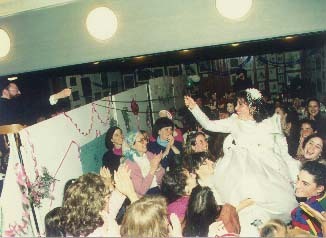 The Wedding Reception: Joyful Crowds, Music and Dancing. From their respective sides, Chayim and Simcha Layah, picked up in chairs, are connected, on one level, through a Gartel. 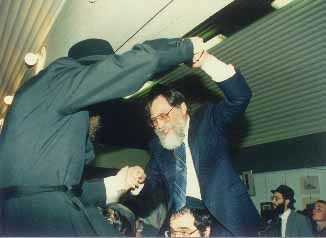 Chayim and his father Gene, dancing on shoulders. 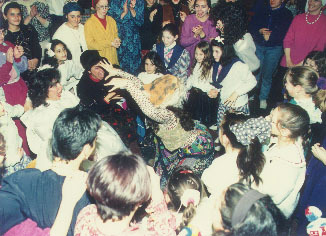 Entertaining the Kallah (Simcha Layah) and her mother. Frightened by a lion. 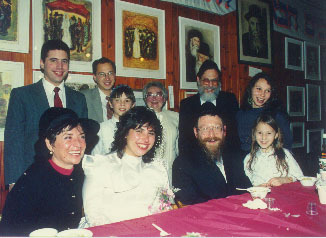 Family attending the wedding: Simcha Layah's mother Brenda, Simcha Layah, Chayim, Chayim's sister Debra's daughter Rachel, Simcha Layah's brother Joshua, Chayim's brother Steve, Chayim's sister Debra's son Oscar, Chayim's mother Joan, Chayim's father Gene, and Chayim's sister Debra.